Neto could be on his way to Anfield. 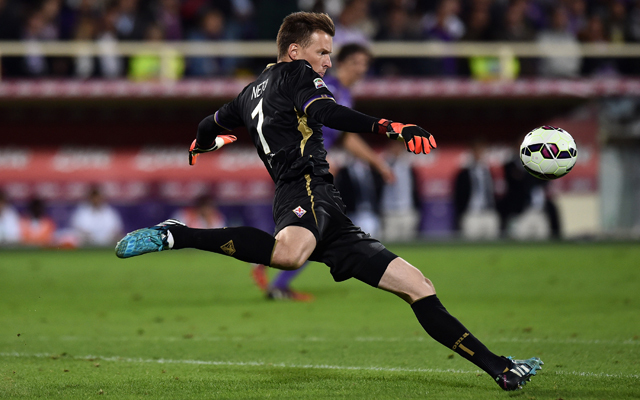 There could be some good news for Brendan Rodgers in the pursuit of a new goalkeeper in the January transfer window as Gianluca Di Marzio says Fiorentina No.1 Neto wants to leave. La Viola have finally given up on retaining the Brazilian after he rejected the latest contract offer from the Serie A club and it seems he now has his heart set on a move away from the Stadio Artemio Franchi. Juventus are keeping a close eye on things as they look to life without long-term stopper and captain Gianluigi Buffon, who at 36-years-old is certainly approaching the end of his career with all the best will in the world. AS Roma have a similar issue with Morgan De Sanctis – who is 37-years-old – although it seems they have their sights on out of favour Chelsea stopper Petr Cech instead. However, it seems we remain the favourites to sign the 25-year-old, with Rodgers desperate to find an improvement on out of form duo Brad Jones and Simon Mignolet. Mignolet has been so shaky between the sticks that Jones was drafted in for three matches – although looked even worse than than the Belgian – and a new ‘keeper has to be a priority over the next month if we are serious about reaching the Champions League places again.